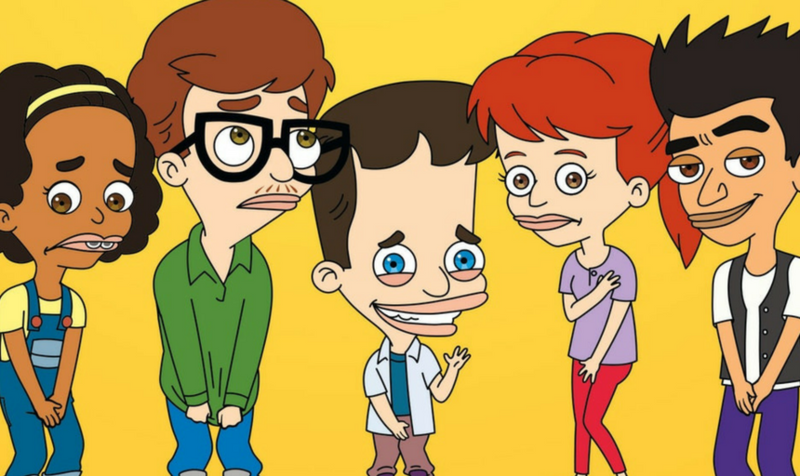 Big Mouth, the animated lovechild of creators Nick Kroll, Andrew Goldberg, Jennifer Flackett, and Mark Levin, recently debuted with both a new season and a few new additions onto their writing staff. The animated show revolves largely around a group of main characters, interlinked with the closest friendships that prepubescent adolescents can manage, and all the turbulence and trauma experienced within the scope of the average middle-schooler’s life. That is to say, quite a bit of trauma. The second season opens on a flurry of troubles being milled through by each developing character’s arc– Nick Birch, voiced by Nick Kroll, represents for all the kids out there who identify as shamefully late bloomers, while Andrew Glouberman (John Mulaney), deals with problems at the opposite end of the spectrum with rapid growth spurts and parents that take care to constantly bolster his self-consciousness regarding such. Jessi and Jay (Jessi Klein and Jason Mantzoukas) return from their flurried runaway romance montage and slip slowly back into equally shame-filled realities, coming back to broil in their insecurities all the same. This season also introduces new characters into the ensemble, among the most important being Gena (Gina Rodriguez), and the Shame Wizard (David Thewlis). Shame– the experiencing of, and subsequent dealing with, proves itself to be a fairly big theme this season, as well as adolescent insecurity bred from over-analyzation and over-thinking about every possible aspect of the middle school existence; Big Mouth manages to capture it all perfectly. They’ve perfected their ability to wield the sharp, double-edged blade of empowering, politically correct satire, and with that, they hack away at the soul-wrenching embarrassment embroiling the lives of these preteens and give a realistic look of the handling of such, or lack thereof. Season two expands on issues introduced in the first and touches gracefully on how divorce affects kids, body issues regarding males and females alike, and the friend-zone. Things for the viewer and the characters alike get bad, gross, and weird during the course of this season. It’ll take you to the absolute brink of what you believe to be an acceptable amount of discomfort, and push you right up to what would seem like the last moment in which salvation was even relatively possible, and then? Just when you believe yourself to be an exact second away from browsing the Netflix main menu, residual disgust clouding the choice you’re about to make in the next choice of your binge-streamed media, the show provides just that. Salvation. It’s no Instagram positivity post, but it certainly does the trick. The uplifting messages the show conveys are balanced perfectly with the meta jokes and occasional fourth wall breaks, and, all in all, there’s just enough substance to make it worth checking out.